Education continues to be our strongest vertical market from our inception thru 2016. 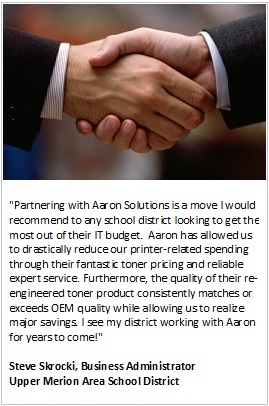 With many schools experiencing shrinking IT budgets, Aaron printer/projector products and service solutions are a perfect fit for a wide range of educational institutions. Aaron academic clients range from both private schools & public school districts to community colleges, universities, administrative agencies, and grant-based agencies. Below are just a handful of quotes from pages of testimonials. Submit your printer fleet information to receive a free cost-savings analysis and see if joining the Aaron team is right for you. Click here to find out! © 2018 Aaron Solutions Company. All rights reserved.